Police officers could become “pawns” in routine family disagreements under new domestic abuse legislation, it has been warned. The Domestic Abuse (Scotland) Bill will introduce a specific offence to punish those who subject their partners to physical or psychological harm. Legal experts have raised concerns the legislation is too broad, with rowing couples in otherwise healthy relationships potentially set to be criminalised. The Scottish Police Federation (SPF) said it was worried its members would frequently find themselves the “reasonable person”, as described in the legislation, who is required to assess whether a person’s behaviour constitutes abuse. Calum Steele, SPF general secretary, said: “The SPF finds domestic abuse to be utterly abhorrent and we are supportive of any practical measures that can be taken to protect and mitigate the effects on the victim. Whilst self-evidently no-one wants to see victims being left to suffer, we see real risks that police officers could be used as pawns in routine family disagreements where the police happen to be called. The Glasgow Bar Association has said the proposed new offence must be balanced against the “very real risk of over-criminalisation”, while the Law Society of Scotland has previously called into question the need for the bill, arguing the offences are covered by existing legislation. Andrew Tickell, a law lecturer at Glasgow Caledonian University, told MSPs he had “serious concerns” the legislation would “criminalise commonplace friction in family relationships”. 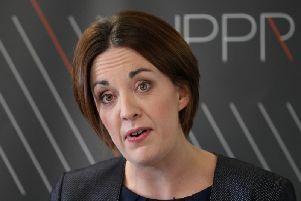 A Scottish Government spokeswoman said: “Quite rightly we have moved on from the days when the justice system would not intervene in so-called domestic situations of abuse and no-one should have to suffer from experiencing abusive coercive and controlling abuse, sometimes over extended periods of time and with long-term physical and psychological effects.